Making money from your blog is not that difficult. Anybody can do it with a little bit of discipline and passion for blogging. Making a full living from blogging, so that you no longer need your day job, is a different matter altogether. People who do it have immense reserves of self discipline and an insatiable thirst for knowledge. While the latter has never been a problem for me (I think I live to learn! ), it is the former which I completely lack. Therefore, I’ve decided to remain content with the little bit of extra “pocket money” that comes my way through blogging, from time to time. For those of you though, who have both the required qualities, I’m sharing a few ways that you can try to make money from blogging. Ebooks, printed books, handmade stuff, courses, software, Wordpress themes, any of these can sell if you’ve already made a “connect” with your readers. I was planning to do this on my craft blog (KraftyFingers), but, international shipping from India turned out to be more expensive than the value of my products! After that, I just got busy with my brick-n-mortar shop, so lost focus on that blog. You can use your blog to show your expertise in a field to get hired. I got my first freelance writing assignment through my blog. This very blog. In 2007. (Just a few months after I started blogging, in fact.) Since then, I have also got a few web-designing gigs through blogging. A lot of online stores offer affiliate programs for blog owners. So if you join these programs and generate sales for them through your blog, you get some commission. It helps if you run a blog in a niche that offers a lot of affiliate programs, e.g. electronic appliances or premium Wordpress themes. You write a post on your blog for a product/company/website and they pay you for it. Or they send the written material and you just post it on your blog for a fee. The amount of pay usually depends upon your blog pagerank and traffic. In India, they like to pay “in kind”, which is a bit of a bummer. You can’t use flipkart gift vouchers to pay for your domain and hosting now, can you? Via banner ads or text link ads. Direct advertising or through an advertising network. To make any real money through this channel, however, you need to be getting a LOT of traffic on your blog. I’d say a thousand page views a day would be a good start. (Only a “start”, mind you.) And building that kind of traffic takes time and work. Besides, this doesn’t work equally for all blogging niches. These are the 5 most commonly used ways to monetize your blog. There are a lot many other ways too, but, I haven’t bothered to explore them yet as they work best for professional full-time bloggers, and I don’t have any such aspirations from blogging as of now. Have you tried any of these channels to monetize your blog? What has been your experience so far? Which ones have worked best for you? This is my 13th post for 2015 AprilAtoZ. 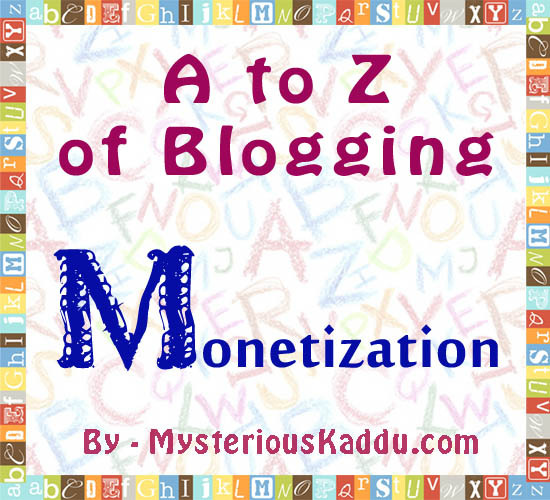 Link to the previous post: A to Z of Blogging: L - Labels. I have been continually getting offers for advt and affiliate mktg which I have chosen to ignore!I am just not comfortable with the idea of leasing my space out to someone right now...i know that's a mindset and maybe i'll be thinking in the opposite way after some time...but right now, I'm totally opposed to the idea! but yes, my blog got me first freelance writing job too...so there...I am earning courtesy my blog! I'm impressed by anyone who can make money with their blog. Not monetized anything yet :) Donno if I'll put ads or sell products on my blog. Sanch, we don't have niche blogs... I think that's why we got to settle with side income. Me too, Matthew! It requires a LOT of self-discipline! Anybody who has it deserves respect! Vinay, you too? What is with you and princess? You could at least put affiliate links for online book stores, couldn't you? You write fiction and poetry.